Third and Chestnut Streets was without car during Philly Free Streets on Saturday, October 28, 2017. Philadelphia is having a public space renaissance, with awesome new spaces like the Rail Park, Centennial Commons, and the Philadelphia Discovery Center coming on line, several new riverfront trails opening over the next few years, and Mayor Kenney's Rebuild initiative set to transform dozens of public recreation centers, parks, playgrounds, and libraries all across the city. But there is one truly enormous source of shared public land that has so far been left out of this conversation: our public streets. Philadelphia has about 2,180 miles of land devoted to public streets, all of which is owned equally by city residents. Most people don't think of them this way today, but in the time before mass automobile ownership, the purpose of streets was popularly understood to be not just a means for moving people but also a source of flexible public space, where children could play, and friends and neighbors could gather. No permits required. As in most American cities, though, Philadelphia political leaders engaged in a massive privatization of this public land on behalf of automobile users over decades, with a coordinated legal, cultural, and political attack on the concept of streets as public spaces, and successfully persuaded citizens to believe that streets should be used only for driving and parking cars. It'll take decades to reverse all the damage caused by this mistaken turn, but there are lots of things forward-thinking city leaders can start to do in the short-term to begin including public streets in Philly's public space renaissance. Folks enjoying last year’s inaugural Philly Free Streets which was held along an East-West route mostly along South Street. This year the route will take you from Old City to Kensington. 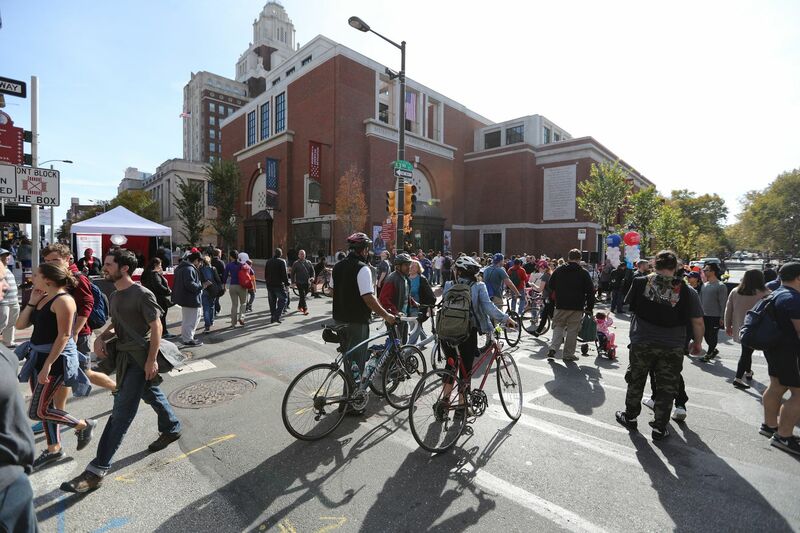 Inspired by the incredible vibes on the car-free streets during Pope Francis' visit, some friends and I organized the Open Streets PHL advocacy campaign that ultimately persuaded the Kenney administration to create the Philly Free Streets program, which closes miles of streets for people-powered recreation. The two Free Streets events the city organized over the last two years were tons of fun and very well-attended; the 2018 event is set for Aug. 11. Unfortunately, the current cost structure of the event is prohibitive for hosting these as frequently as many Free Streets fans want, primarily due to the ballooning costs of police staffing. Most North American cities struggle with the security costs of hosting Open Streets events, but it's worth saying clearly that this is mainly a political problem. Bogotá, Colombia, the poster-child for this idea, is far from the world's richest city, and they manage to close 76 miles of public streets for recreation every single Sunday and on holidays for their Ciclovia program. Clearly there are more affordable ways to host Free Streets events much more often without obliterating the city budget. We should figure it out. Parks and Rec has an obscure program called Play Streets that allows neighbors to close their blocks to cars every single weekday between 10 a.m. and 4 p.m. in the summer. The program is primarily a vehicle for continuing universal free meal programs during the summer for children and youth, and is also a low-cost option for coordinating summer child care. The way it's set up now, the free meals and the block party permission are a package deal. With only so much money to go around, the free meal program should be safeguarded for people who need it most. But there should be a way for people who don't necessarily need the meals to still get in on the free daily block closure part of Play Streets. The program should evolve into something more like Seattle's Play Streets program, which basically gives participating streets a never-ending block-party approval permit. People living on blocks that opt into Play Street status can just throw a garbage can up at the end of the street to close it to cars whenever they want, with no application, no charge, and only a notification requirement for neighbors — not an approval threshold. Pedestrians pass between the sidewalk cafe tables placed on sidewalk and the curb, along 13th Street between Chestnut and Walnut Streets on October 5, 2017. Navigating past the throngs of cafe tables on 13th Street in the Gayborhood as a pedestrian on a nice summer evening can be annoying, but don't blame outdoor seating for imposing the space crunch — blame the parking and drive lanes. In heavily trafficked pedestrian hot spots like 13th Street, Sansom, or South Street on weekend evenings, or the Ninth Street Italian Market on a Saturday morning, to name just a few, there's absolutely no reason to let cars hog so much public space for parking. It isn't necessary to close these places to traffic 24 hours a day, though. The point is to strike a better balance in how we're sharing streets at different times, rather than insisting they be 100 percent car-dominated or 100 percent pedestrianized. The city could introduce some pedestrian-only hours each week on certain corridors, during which cars aren't allowed in. We can have outdoor dining and easy pedestrian access if elected officials could just summon the political will to prioritize more of our shared public space for humans during the most crowded hours. City leaders' vigorous commitment of both dollars and political capital to improving the quality of life in Philadelphia's shared public spaces is truly praiseworthy. But public streets are also public land, and reconsidering our unthinking allocation of every last inch of them to private cars should be a key part of any campaign to reinvigorate the civic commons.